Rooftop solar PV offers an efficient, emission-free renewable source of electricity which can be used off-grid as well as on-grid. Rooftop solar PV offers an effective and efficient method for reducing carbon footprint and generating electricity from solar radiation. The market for rooftop solar PV has been rapidly increasing with the support of government subsidies and tax credits. The rooftop solar PV market have attracted large number of equity investments and funding. Currently, there are two major silicon technologies available: monocrystalline and polycrystalline. Rooftop solar PV systems are undergoing a surge in popularity due to their flexible nature and availability through leasing schemes. Rooftop solar electricity has been able to achieve grid parity in most of the countries. The overall payback time for the rooftop solar PV systems have been reducing, further boosting the market. The rooftop solar market is registering huge investments and funding from the equity and public investors. The Energy Payback Time (EPBT) for 2 kWp rooftop solar systems is around two to three years, thus making these systems an economically viable and efficient alternative. Distributed PVs (DPVs) with a capacity of less than 100 kW are preferred for rooftop solar systems. However, as the difficulties with FIT persist for DPV, solar leasing has gained popularity and is expected to boost the rooftop solar market. Rooftop solar continues to depend on different incentive mechanisms that drive the demand such as technology-specific renewable portfolio standards (RPS) and tenders, tax credits, traditional feed-in tariffs or Power Purchase Agreements (PPAs). Rooftop solar systems are more suitable for self-consumption. Transmission of solar electricity to other sites is less efficient for rooftop solar due to lack of smart grid infrastructure. Electricity trading is done for a limited amount of electricity due to the absence of infrastructure. Although net metering has been implemented in almost all the major rooftop solar markets. Net metering has attracted negative attention from other utilities, including fossil fuel utilities. However, Share of renewable energy in the global energy mix is rising at a substantial pace. Solar and wind renewable capacities experienced maximum growth in 2015. The Paris Agreement enforces countries to strive toward keeping the rise of global temperature in the present century below 2°C. According to the IEA, a minimum of 75 GW of solar capacity was installed worldwide in 2016, which was a rise of about 48% from that in 2015. Decrease in production costs and advancements in technology of solar panels have the potential to reshape the rooftop solar PV industry. Rooftop solar is widely used in commercial and industrial buildings as it provides benefits such as economical cost, less complexity, avoiding of cost of land, etc. Based on the application, the market has been segmented into on-grid and off-grid. The off-grid rooftop solar PV segment held the major share of the market in 2016. Rooftop solar PV systems are available through financial leasing and third-party model which has led to an increase in their demand in off-grid applications. In terms of geography, Europe was the largest market for rooftop solar PV, accounting for more than 70% share in 2016. The Germany leads the rooftop solar PV market in Europe, with the government promoting rooftop solar PV systems by offering incentives and collaborations. Asia-Pacific follows Europe with China as a leading country, with the highest number of rooftop solar installations in the region. Asia Pacific also houses headquarters of several large rooftop solar PV companies. North America was the third-largest market for rooftop solar PV, in terms of market share, in 2016. US is the leading countries with major rooftop solar PV projects in North America. The market in Latin America is likely to grow at a significant rate with anticipated increase in commercial projects across South Africa, Chile, and Brazil in the near future. Key players in the Rooftop Solar PV market include Sharp Corporation, Trina Solar, Pristine Sun LLC, Solimpeks Corporation, Kyocera Corporation, JA Solar Co. Ltd., Yingli Solar, Vikram Solar, Canadian Solar Limited, RelyOn Solar Pvt Ltd. and Sunshot Solar Co. Ltd. In order to bolster their position, companies are focusing on product development, enhance outreach and expand client pool by means of strategic mergers & acquisition. In 2016, Sharp Corporation made a JV with Shigemitsu Shoji Co. Ltd. to work on first large solar power plant in Mongolia and in the same year they have signed an agreement with Big C Supercenter, Thailand largest hypermarket retailer, to construct rooftop solar system. 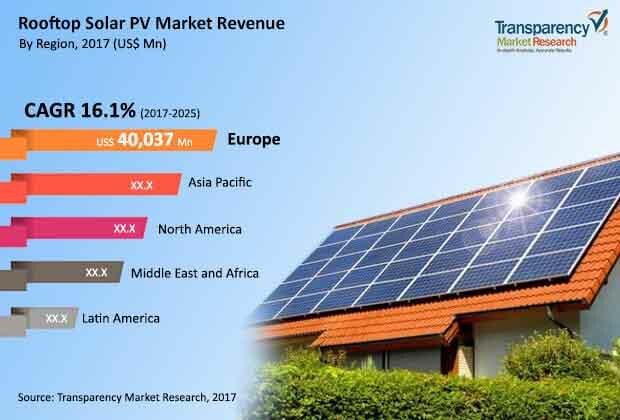 The review is based on a report by Transparency Market Research (TMR), titled “Rooftop Solar PV (Application-On-Grid and Off-Grid; Region-North America, Europe, Asia Pacific, Latin America, Middle East & Africa) Market – Global Industry Analysis, Size, Share, Growth Trends, and Forecast, 2017–2025”.